Marketing automation is just smart business. There are some great digital marketing tools out there that are designed to help you achieve your marketing goals, while saving a ton of time. For a start they allows small businesses with limited staff and time, the ability to run marketing campaigns that increase website traffic, boost online brand awareness and power up your social marketing. 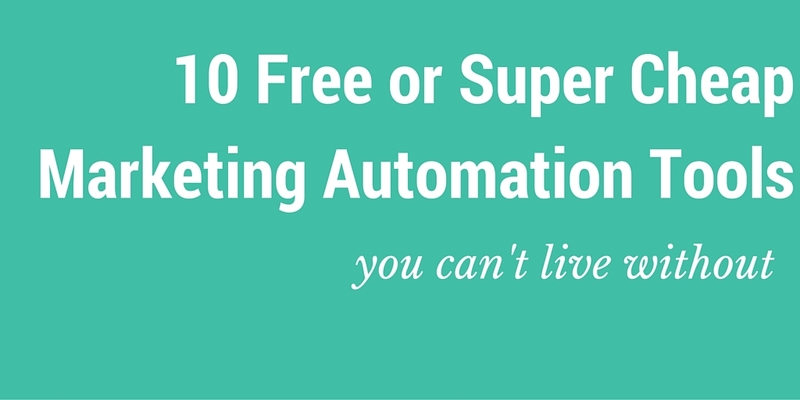 Here are 10 of our favourite free or super cheap marketing automation tools you should check out. Sniply is smart marketing software that helps you to drive conversions by making it easy for you to add custom call-to-actions on any webpage. You can also quickly generate unique links to share and monitor how you audience is engaging with content. It also connects with other popular apps such as Hootsuite, Buffer and Mailchimp. There’s a free trial to get started and prices start from $29/month after that. This easy to use digital marketing tool is perfect for small businesses who are looking to run some email marketing with software that’s easy to use and affordable. With customisable templates, tracking, reporting and a mobile app this has all the functionality without the big price tag. Turn your marketing plans into real content by using this software that’s designed to help you plan, manage and create content more efficiently. They claim that they can save you 30 minutes, while getting you 30% more website traffic – making every piece of content work harder for you. SumoMe has a whole host of digital marketing tools and software that can help you to grow your website’s traffic, but if you want to grow your email list then List Builder is starting point. It helps you to convert one time website visitors into lifelong readers and email subscribers. Glasshat takes the guesswork out of how to increase your website traffic by helping you effortlessly create, and put into action, digital marketing plans for your website. Enter your website to generate a prioritised list of digital marketing ‘things to do’, which are generated with full instructions on exactly how to get the job – it couldn’t be easier. Get started on a free trial with a $49/month cost after that. Buffer has been around for a while now, but it still has a place on any good digital marketing tools list. Buffer is the smarter way to share on social media, helping you to share your content at the best possible times throughout the day – driving more traffic to your website by making sure you get the most out of each post. An easy option to get started with marketing automation for busy people, Zapier is a smart little tool that lets you move information between your different web apps automatically – which means you don’t have to spend time and effort doing it in person. For example if you get an email in Gmail, Zapier can automatically trigger to copy the attachment from Gmail to your dropbox account. Leadpages is a marketing tool that lets you choose from hundreds of mobile-responsive pages with drag and drop customisation and easy A/B testing, this tool is perfect for a small business or solo entrepreneurs who want to make sure their website traffic converts. This marketing automation platform offers a free bare bones version well suited to small business owners who want to make sure their converting website traffic into customers. This clever messaging platform helps your to automate emails to your customers and triggers messaging, at the right time and to the right people. Jumplead encourages customers to use it’s marketing automation software to ‘explore and learn for free’. Sounds good to us. The free version of this digital marketing tool helps you to convert your website visitors into leads and helps you nurture them into customers. Think live chat, conversion pages and a contact CRM. Explore it for free, with the option of upgrading to a $49 package.